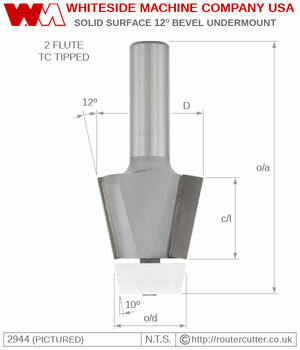 Whiteside's 2944 12° degree bevel undermount router bit is a must have for routing solid surface worktops; for perfect installations of undermount kitchen and bathroom sinks and basins. Supplied with a 10° beveled nylon ball bearing. The non-mar nylon sleeve is great for bearing guided routing in dense material without leaving any scratches or rubbing.